Orlando was home to me for most of my life – from grade school to high school, and the my adult life after the military. Then, DotNetNuke Corporation snagged me up earlier this year, causing me to move to San Francisco in June. Oh, darn! :D December will officially be the 6th month that I have been away from the Orlando DotNetNuke Users Group (ODUG), but I WILL BE BACK! I mentioned this during the keynote at DotNetNuke Connections in Las Vegas a few weeks ago but I thought I should highlight it again. 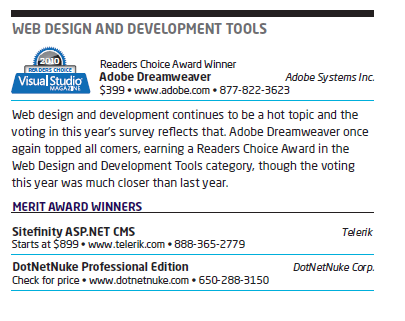 Visual Studio Magazine conducts its Readers Choice Awards every year and I am proud to announce that DotNetNuke was a Merit Award Winner in 2010 in the Web Design and Development Tools category. We share some esteemed company with Adobe Dreamweaver and Telerik’s SiteFinity. DotNetNuke has not received much industry recognition in the past due to the fact that open source projects are usually ineligible to participate in contest’s of this nature. However the availability of our Professional Edition now allows us to compete with other commercial software solutions and get the recognition we deserve. Thank you for your support. Awards such as this do provide greater industry visibility for DotNetNuke which helps cultivate the growth and prosperity of the entire DNN ecosystem. Next week, I will be holding a public webinar covering the topic of “content staging” in DotNetNuke. Content Staging is the concept of having a “staging” environment that your normal website visitors cannot access. Within this method of content editing, all of the content updates would take place on that internal or “staging” server. Then, when you decide, you publish those content updates to your production site, without your content editors ever having to login to your production web server. When you think about presenting any topic to an audience, there are quite a few things that are common to presenters, no matter what the topic or type of presentation it is. You want to be well-prepared. This sounds super simple, and even trivial enough to not have to mention, but it’s not. Not even for the most seasoned presenters out there. Configuration Manager: A new configuration manager provides DotNetNuke administrators with greater access and control over their website configuration files without requiring the user to have direct file access. Site Search: Exclusive to the Professional and Enterprise Editions, the new Site Search engine allows site users to quickly locate files and pages in the site. The search engine includes rich query syntax with support for Boolean searches, phrase searches, relevance searches, wild cards, fuzzy searches, and groupings. Based on Lucene, the system includes a true web spider that is capable of indexing any site, whether it is built on DotNetNuke or not. Enhanced Analytics Support: The DotNetNuke Professional and Enterprise Editions include Enhanced Analytics Support, which allows users to take full advantage of Google Analytics. The system has been upgraded to the latest integration best practices from Google and now enables tracking of sub-domains as a single entity as well as the use of up to five segmentation rules per page. Content Approval Workflow Enhancements: The Professional and Enterprise Editions now allow managers to configure approvals in a top-down hierarchy at the site, page, and module level. In addition, content locking improves efficiency and reduces the chance of workflow conflicts. Approvals ensure that users throughout the organization that are impacted by a content change can review updates before they are published. The business rules engine enables workflows with an unlimited number of states and reviewers.